Plus UNLIMITED classes for that first month! Interested in working out with Kettlebells? Offer expires 3/31/2013 and is available for new clients only. 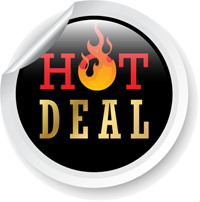 Offer is not redeemable for cash or credit and cannot be combined with any other offer (Groupon or Living Social deals). All classes must be used within 14 days of first class. Kettlebells South Bay reserves the right to change or cancel this promotion at any time. I had been doing kettlebell workouts to a DVD for a while but didn’t feel like I was getting the results I wanted and I knew I needed more instruction on proper form and technique. I learned about Kettlebells South Bay at a fitness expo and decided to check them out. Joe understood completely what I wanted to accomplish and all of our training sessions were a reflection of this understanding My first impression of Joe is that he is a great listener. I knew what my fitness goals were and shared these with Joe. I hired Joe because I am a huge fan of kettlebells and I thought they could be useful in helping my daughters train in gymnastics. Joe understood the needs of our family immediately and came totally prepared. He started by giving us each an individual assessment on technique and ability. Not only am I impressed with the results, I am getting from the workout but I am equally impressed with Joe’s interaction with his students. I was apprehensive before taking kettlebell classes with Joe but, after the first lesson, I was hooked! Check our schedule for the newest classes.